But there is no reason why you can't have a monster with better arms and a better drive system that can traverse stairs. Below is an overview of drive systems, feet, thoughts and other bits of information for you to draw from and build on. WHEELS - now with wheels your robot moves about in a straight forward way. Most people use differential steering, that is to have to motors and drive wheels (right and left) and caster wheels in the front or back or both for support. Driving the robot is much like a tank and if the wheels are centered your robot would spin on a dime. Another idea for wheels is to use TRI-WHEELS. This gives the robot the ability to roll over and climb things like steps. I look at this system as an uncle of the rocker-bogie system that was used on the Mars Sojourner built by Nasa's JPL. Here is a link to a robot clone of Sojourner. Below is a linked picture of how tri-wheels can be used to make a Lego robot. The site gives a good overview of how the basic idea works. One suggestion though, with normal wheeled robots you can make the body ridged, but with a robot that is going to climb or descend steps I suggest making a moveable waist so your robot can shift it's weight. Other wise I would expect your monster fall right on it's face. TRACKS - this is much the same as with wheels, but when your robot spins it's tracks can get caught on things like carpet. Your tracks can also slip and your robot can become off course from the way it was heading. There is a lot more friction with tracks on a robot so it is a must that you have good motors, good gearing, and the robot is of good construction! For little robots I would suggest hacking a toy of your choosing. But for a monster this is not practical, unless you want a small monster. I myself want a big monster. The question so often asked is, "where can I get tracks?" For buying them I have heard of snow mobiles with tracks, if you could find a place that sells replacement parts you would be in business. Or try your luck at a farm and off road vehicle shop or supplier. Now for making tracks I have seen articles where you can make your own from molds, like the one from the Seattle Robotics Society's Encoder. You can make each link or you might try a large gear chain and then make treads to attach to the chain. 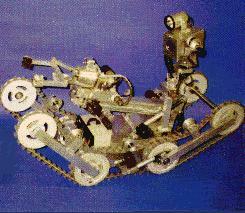 Now when I think of tracks I think of the Andros robot built by Remotec. These robots are tough and build to climb over most anything, including stairs. They sell a mini version of the robot, only problem is the company is owned by Northrop Grumman and they really only sell to lawenforcement and research agencies. But below is a linked picture to their site, you might be able to see how they made the drive system. It's important to note that this robot uses articulated tracks...in other words the motors move the tracks up and down so that optimum traction is constant. Now for suppliers for many of these hardware parts like chains and gears I would start my search here at Power Transmission. Yet another idea is to have legs and wheels. This would allow the robot to walk over objects and traverse steps, yet allows your monster to roll with wheels quickly over smooth floors or concrete. Not many people have tried this set up. I believe it was Hans Moravec who first suggested a system like this, but I might be wrong. I hope to have a picture to of this envisioned platform here soon. Be it feet or wheels you'll want feed back so your monster will know if it is rolling or walking. When you have feedback on your robot's movements this is called a closed loop system. Have you ever feel sleep on your hand while taking a nap at work? The when you woke up you could move your hand, but you could not really feel it for a few seconds and ended up hitting yourself in the head when you meant to rub your eyes? Maybe that's just me? =) Point is you can see how feedback can be very important to your monster as it gives the monster a sense of it's self. One way is to provide wheel encoders on your drive motors or wheels. You would use an IR sensor on each wheel and create a disk (or use the wheel it's self) and alternate between black and white strips, large strips. Then with your software you count how many times it rotates between black and white. This could be used if your robot gets stuck...your motors might stay on but if your software reads no cycle from the wheel encoders then your software could reverse the motors or shut off and sound an alarm for help. This is just one small example of how useful motor encoders can be.